The LG404G green laser sight for 1911 pistols combines Crimson Traces celebrated Lasergrips platform with the visible advantages of green laser technology. 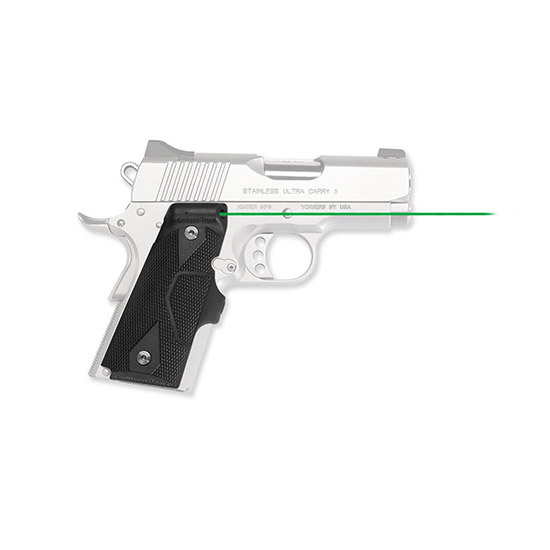 Using the smallest laser green laser diode available these Lasergrips emit a powerful green beam yet still provides over two hours of run time on four CR2016 batteries. This Lasergrip is for 1911 Compact. It compatible with Colt Officer Defender Kimber compact ultracarry ultraelite ParaOrdnance compact singlestack Springfield Armory compact ultracompact Wilson Combat and most other 1911s with grip screws measuring 21116 apart."